Sometimes I feel like I’ve tried every chocolate chip cookie recipe, so it’s nice to find one that’s unique. And by “unique” I don’t mean made with specialty flours or flavorings, but rather traditional chocolate chip cookies with unusual ratios or baking methods. Ultimate Salted Chocolate Chunk Cookies fall into that category. The cookies have an interesting ratio of butter to other ingredients and are baked at 450 degrees. The recipe is from Why Your Chocolate Chip Cookies Never Turn Out Like You Want, which is worth reading because it is less like a cookie baking manifesto and more like advice from a friend. 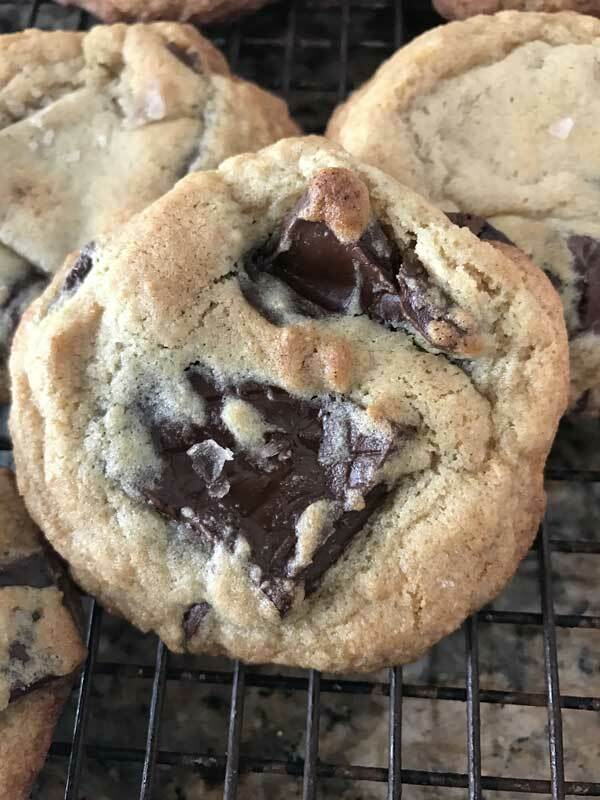 The author encourages editing your own favorite recipe, but to cover all bases she throws in her Ultimate Salted Chocolate Chunk Cookies. The cookies are so good! They are soft and chewy, medium thickness, have lots of cracks and crevices and a pretty brown hue. You have to watch the cookies pretty closely, though. Baking chocolate chip cookies at 450 is my idea of living on the edge, but it can work if your oven temp is accurate and you pull the cookies at the right time. In the spirit of the article, you may want to keep the dough the same but experiment with time and temperature. And a final FYI — the cookies in the first photo were made with dough I chilled for 24 hours. The cookies in the photo above were baked with dough I chilled for 10 minutes. Chilling the dough makes these cookies even better. 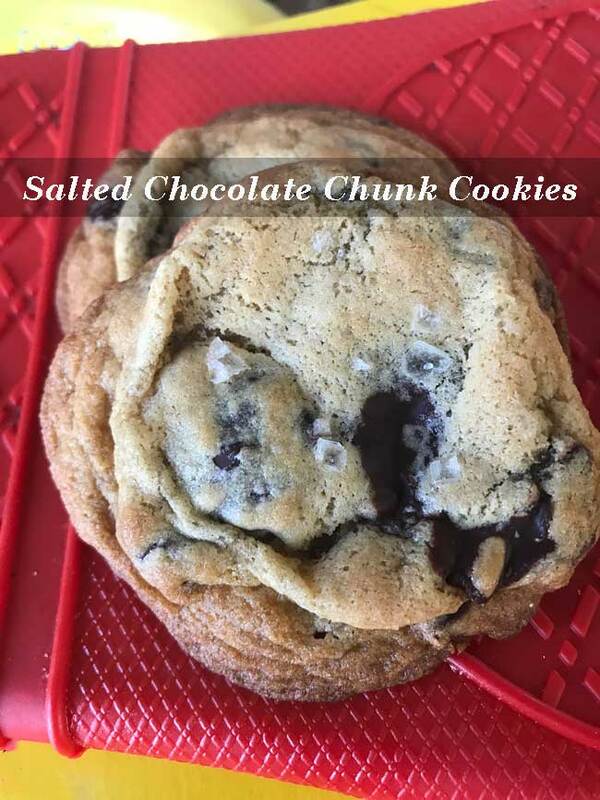 Ultimate Salted Chocolate Chunk Cookies are chocolate chip cookies made with rich chocolate chunks and baked at 450 degrees. Whisk together the carefully spooned flour, baking soda, baking powder, and salt. With an electric mixer, beat butter and sugars until light and fluffy, 2-3 minutes. Add eggs and vanilla and beat until pale and fluffy, scraping bowl often. Reduce mixer speed to low (or do this part by hand) and gradually add flour mixture until just blended. Fold in chocolate chunks. Scoop dough into even portions (about 2 tablespoons each) and arrange 2 inches apart on 2 parchment paper-lined baking sheets (maximum of 6 cookies per sheet). Refrigerate sheets until dough is firm to touch, 10 minutes. Better yet, refrigerate the ones you need to eat right away for 10 minutes, but the rest of the formed dough balls in a bag and wait until the next day to bake. The cookies will be even better! Bake the cookies at 450 degrees for about 6 to 8 minutes -- watch carefully. Pull them when they are just starting to brown. If you're not having luck with 450, try doing the same thing at 400. If you have a convection oven, try baking at 375 for 8 to 10 minutes. Let the cookies cool on the baking sheet, then carefully transfer to a rack to cool completely. I baked the cookies with a few different types of chocolate -- Lindt Dark with Sea Salt, Trader Joe's Dark and Ghirardelli Bittersweet Chips. They all worked quite nicely, especially the Lindt which melted quickly and contrasted nicely with not-so-buttery cookie dough. The chips worked surprisingly well, but I felt I needed to use a whole lot of them to reach a satisfying richness level. Also, I'd stick with European style butter to cram in more fat/less water. Carol, thanks for the review! I’m glad the recipe worked for you. After all these years of baking I’ve come to the conclusion that not one recipe will work for everyone and that there are so many variables. So it’s good that this one worked. I like Whole Foods butter, btw. I’ve noticed different results with different brands since I’m always switching around, but Whole Foods is pretty good. Glad you liked them! I made these for a crowd yesterday and they were soooo good! Anna, you are always my go-to when I’m looking for a recipe, and especially for chocolate chip cookies. It was fun to find this newer recipe here and try it. I loved the chewy consistency but still with crisp edges and a good size and thickness. This is a keeper for sure. I think I will try cut-up bittersweet chocolate bar next time, and add salt to some. I’m looking forward to hearing what you think of the cookies made with dough chilled overnight! I made these today and they turned out really great. The texture is excellent. Firm but not hard outside. Soft inside. I used 450 degrees and an air bake cookie sheet. I only baked for 6 minutes. They got a little darker than I anticipated and I was afraid they would be over baked but they’re not. They’re excelllent. I only baked four and the rest are chilling for another day. Hi Laura, that thought goes through my head every time I bake cookies, but I do it anyway :). Glad you tried the 450 heat. I guess it will vary from oven to oven, baking sheet to baking sheet and dough to dough. 450 is not a very reliable heat to bake cookies at, but I found the cookies to be just as good baked with convection or even at a lower heat. Next time I’ll try your trick of just turning off the oven after 6 minutes. 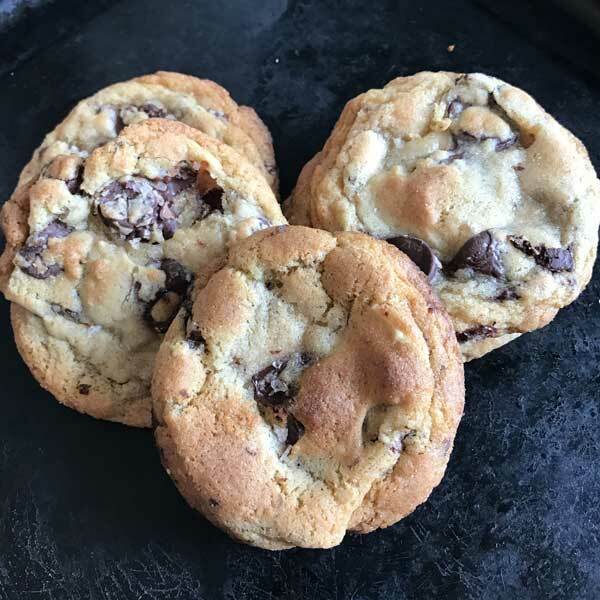 Although I was thinking to myself “I don’t really need another chocolate chip cookie recipe”, I decided to try them and wow – these were great! Family members stated that these are possibly the best ones I’ve ever made. Loved the contrast between the brown, firm edges and the softer center. I did bake mine at 450, and after 6 minutes they were getting really brown but obviously not done in the center so I turned off the oven and let them sit for another 2 minutes before removing. They were perfect! Yes, with such a high heat they’d probably be great! I still use air bake cookie sheets for most cookies. Do you think those would be okay for these? Yes. Mind blown at 450 degrees! I can’t wait to try it!! Yum!!!!!!!!!!!! Those chunks sure look good. I just tried comparing my chocolate chip cookie dough rested overnight vs. not, a few weeks ago, and the texture was the biggest difference just b/c the dough was chilled. We had a hard time telling the difference in the flavor, but I know that’s because I’d browned the butter and did it separately for each recipe, so there was just too much of a variation there. From every blog/cookbook/chef I’ve heard it sounds like the overnight rest makes the cookies better, so I’ll just trust that. Must say it was a fun taste test to do 🙂 Anyway, enjoy your cookies – these look and sound great! You had me at “salted”. Whenever I’m making cookies for myself I always add extra salt so these are right up my alley. 450! My mind is slightly blown here.